On July 10-13 the city of Yekaterinburg (880 miles east of Moscow) held Innoprom, an international exhibition that gathered together technology entrepreneurs and state officials from 95 countries. RBTH selected five of the most interesting Russian tech innovations from among those exhibited. 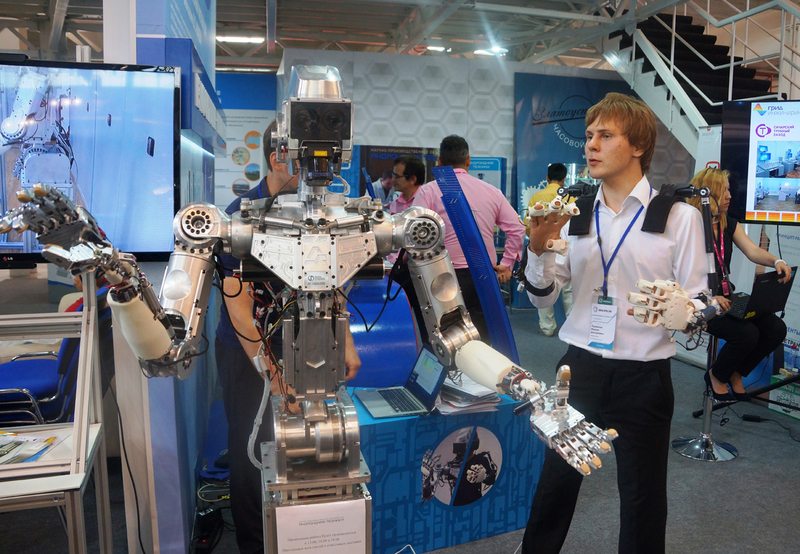 Android Technology, creator of the Rescuer anthropomorphic robot, is a high tech supplier to the Russian defense sector. Therefore, most details are secret. What we do know, however, is that the robot can be called a "universal soldier,'' and can save people from cave-ins, as well as extinguish fires, and work in dangerous areas such as chemical or radioactive facilities. It can be guided using a special suit located in any place in the world and with a reaction delay of one millisecond. Android Technology's representative, Alfia Sirazetdinova, said the robot might be able to participate in international robotics competitions in order to prove its superiority to competitors. For this, however, permission from the Russian Defense Ministry is necessary. The smart fire-extinguishing module developed by Innovational Fire Safety Systems is integrated with the Internet, and it can service itself and report any faults via SMS, email or app. Even if the electricity fails, the device will still work and put out fires. The modules are already available at FSB offices, Sberbank branches and supermarkets. "At the Leningrad nuclear power station, for example, it previously took the inspector 90 minutes to check the fire-extinguishing system' s efficiency; but now he can use a mobile application to immediately see the state of the 40 modules, the last time they were serviced and what must be done," explained Sergei Lektorovich, director of Innovational Fire Safety Systems. The module's exterior is a high-pressure container similar to the one used for moonwalkers. The Moscow company, T8, exhibited equipment to send one of the longest and largest digital signals in the world. The device can send a signal of 8 terabits per second through an optical fiber. This means that in one second you can send 1,600 HD films over a distance of 4,000 kilometers. This innovation helped the company become one of the top four in the world in the production of such equipment, along with competitors from China, Finland and the U.S.
"Our equipment significantly reduces clients' construction and service costs," said Konstantin Marchenko, T8's deputy general director. The company is entering foreign markets such as Iran and Vietnam, and there are negotiations with India and Indonesia. T8 also presented a security and surveillance system called the Dunai vibroacoustic sensor. It can control fiber optic segments at a distance of between 40 and 75 kilometers. The acoustic microphone hears everything, and in the event of danger it sends an alarm signal. The device was developed to provide security for oil and gas pipelines, but now it will be used in Russia to control plane takeoffs and landings, as well as to observe the condition of railway networks and train movements. The sensor can detect a cracked rail, or a damaged plane wheel bearing and other defects, because these produce distinct sounds that differ from general background noises. The company Monocrystal showed synthetic sapphires. Last year the company grew the biggest sapphire in the world that weighed 300 kilograms; competitors in the U.S. and China have only been able to grow a crystal weighing 100 kilograms. Sapphire is the second hardest material in the world after a diamond, and it basically cannot be scratched, which is why it's used for camera lenses and smartphone screens. More than 98 percent of the company's production is exported. According to the Yole Development analytical agency in France, one out of every three smartphones in the world was made using material from the Russian company.